A Norman castle in Northern Ireland to the northern shore of the Belfast Lake. The castle played an important role on the military front until 1928 and today is one of the most well maintained structures in Northern Ireland. The castle is home to historical displays as well as cannons that belong to the 17th and 19th centuries. The impressive monument is an interesting piece of history and therefore is a recommended visit in the city of Belfast. Pets are not allowed in the premises. 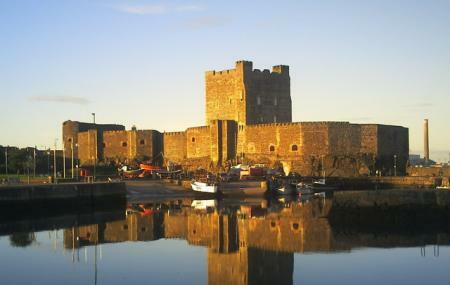 How popular is Carrickfergus Castle? People normally club together Belfast Zoo and St. Nicholas Church while planning their visit to Carrickfergus Castle. Oh this was so cool, and to think how old it is. The stories it tells, and the history is just incredible. We had a beautiful sunny day here. If you like castles this is for you. If you're in the north of Ireland this is a must see. Plus Carrickfergus is a great town on top of it all. Check out some pictures we took here. This was our first stop on the tour to Giant's Causeway. It was a fantastic place it was around 9 am in Morning and sun was rising so we got fabulous pics there. Castle not too big but nicely located. There are many old boats and new boats around that these make place even more beautiful. Also you can find many shops around it, Sainsbury's is also there. Nice place !! Nice castle but not much to see as one part was closed. Kids could dress as knights or princess, that was really cool. History of the castle well explained. Fantastic self guided tour. The main tower was closed halfway up so be sure to ask before purchasing if that's important to you. We were bummed but the experience was still well worth it. Best fully intact and oldest Norman Castle on this Island! A must see on any Castle Bucket list. This is a real defensive Norman built castle with 3 metres thick walls! not some grand house called a castle! This is the real McCoy! A proper castle!